A 3D printer is a machine that turns a digital model into a real object by repeatedly layering small amounts of material. 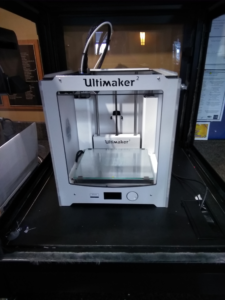 The Charlevoix Public Library has two printers: Makerbot Replicator 2x, which uses ABS (Acrylonitrile Butadiene Styrene) Plastic Filament and Ultimaker 2, which uses PLA (Polylactic Acid) Plastic Filament. How do I submit a print request? Files or website link can be sent to: cpl3dprinter@gmail.com or dropped off at the Circulation Desk via flash drive or SD card. Anyone can send in a print request. It will take a few days for your request to be processed and printed. $.10 per gram with a minimum charge of $1.00. An estimate price will be given before printing. Ideas include: coasters, door hangers, stands, containers, replacement parts, figurines, dog tags, luggage tags, picture frames, etc. The programs used are CAD based programs. There are several free programs available that can be used online or downloaded to be used on a computer or mobile device. We will call or e-mail you when your item is ready to be picked up. Finished items can be picked up and paid for at the Circulation Desk. The library reserves the right to refuse any print or to stop a print in progress. Any item not picked up within 14 days of being contacted will become the property of the Library. 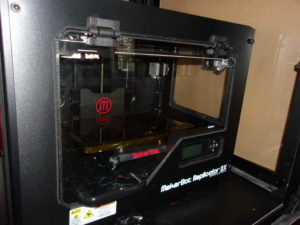 The 3-D printers were made available by a grant from the Leo S. Guthman Fund.